I've been applying finishes similar to the one you saw in my "Old World Love" post. Here are a few of the pieces I just finished with various shades of grey. 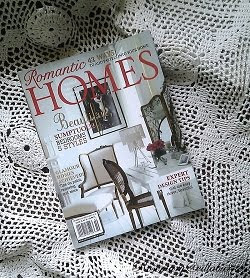 Way back in June, I did a post entitled "A Romantic Mood". 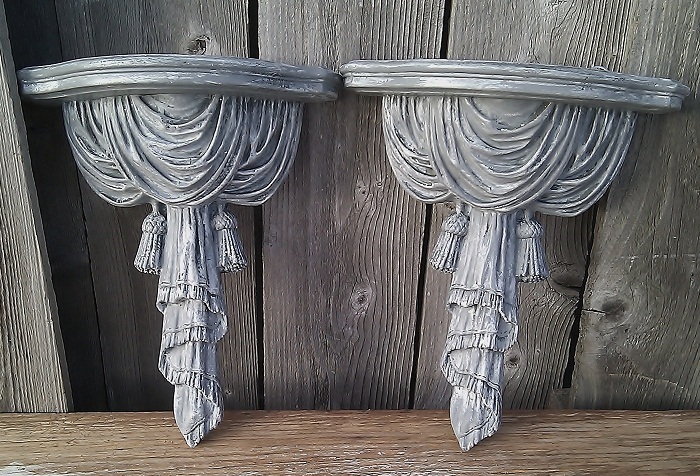 In it I shared a pair of corbels I painted a soft pink. They received a makeover. This was the first makeover. 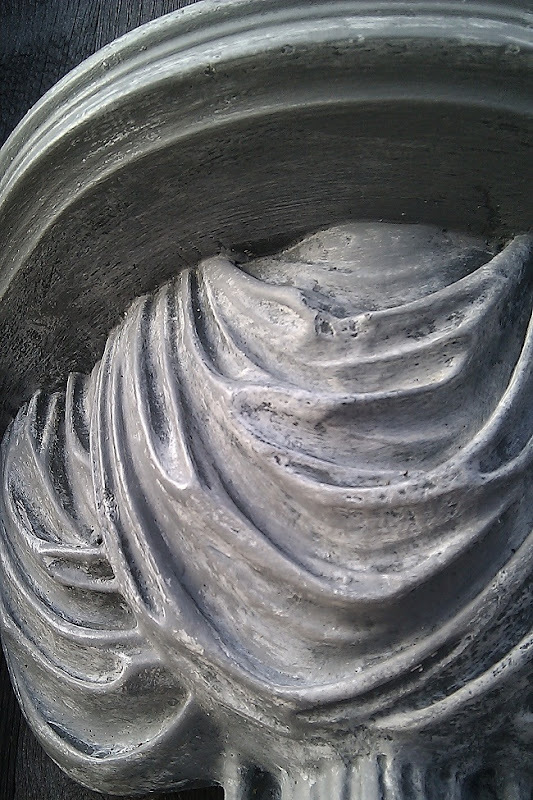 I applied layers of deep grey, followed by a wash of white gesso. After some rubbing back, and a little dry brushing, I had a new look. I finished it off with wax. I gave this composition cherub a lighter grey finish. With the proper preparation, the finish can work on glass as well. 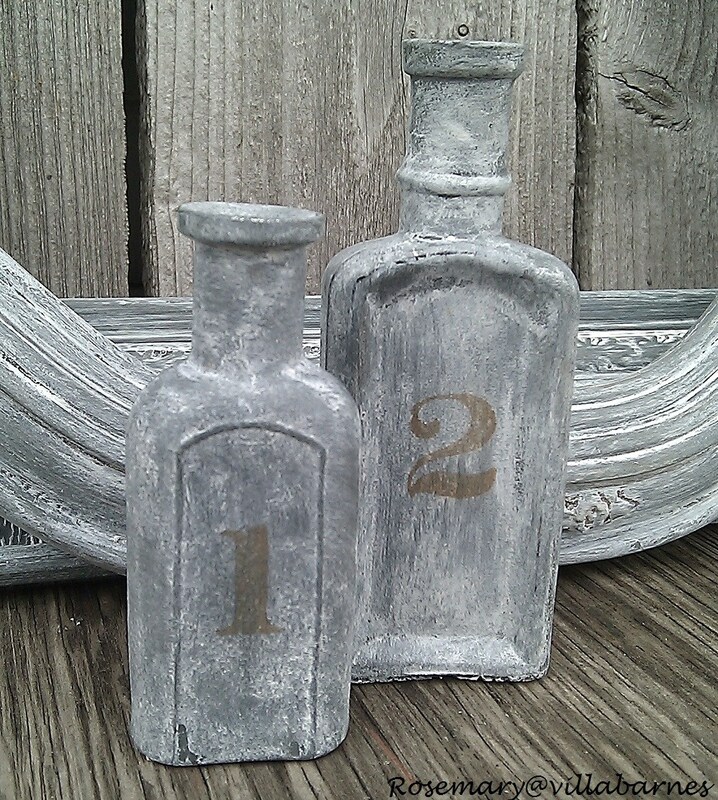 After applying the finish to these bottles, I added the numerals. Then I added rusty stars. 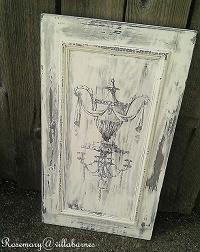 With paint and gesso, you can add so much character to simple objects. I'm finishing up a few furniture pieces. I'll be back to share the results. Love the corbals and the cherub. The finish gives them such a romantic touch. The bottles turned out so cute. Kind of a rustic elegance. I love them! ooh i love those numbered jars! they are SO cool! Your find the best pieces to make over! Love the bottles, and the details! Beautiful! I love the bottles with the numbers - very cool. You are so talented - appreciate that you share your process. your stuff always turns out amazing! Love it all! I'm starting to see a whole lot more gray in my store than I use to. I like it!! As always fantastic! Now I really love the glass bottles! So unusual! Well....you taught me something else new today, my talented friend! : Gesso on glass? Waaaay cool! Love the patina! Thank you so much for sharing the technique! Love the corbels and that finish on glass is amazing, great idea adding the star. I just love it all! 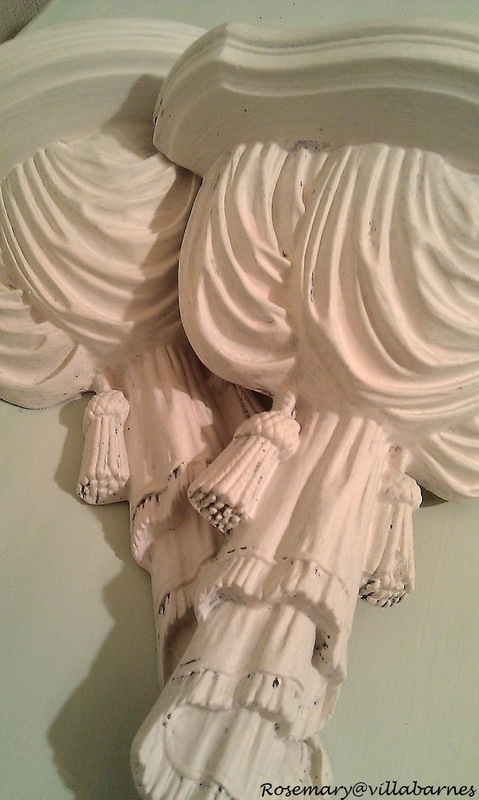 Both pairs of corbels turned out so nice! I love how you applied the technique to the glass bottles and the end result. Nice job! Blessings from Bama! All of your finishes are gorgeous, I wish I knew how to do some of them. I do believe you are the master of all finishes Rosemary! Just beautiful. I love the bottles! They turned out amazing! I love the added numbers and rusty star, too. Amazing transformation on the glass. I love the numbers and the star! 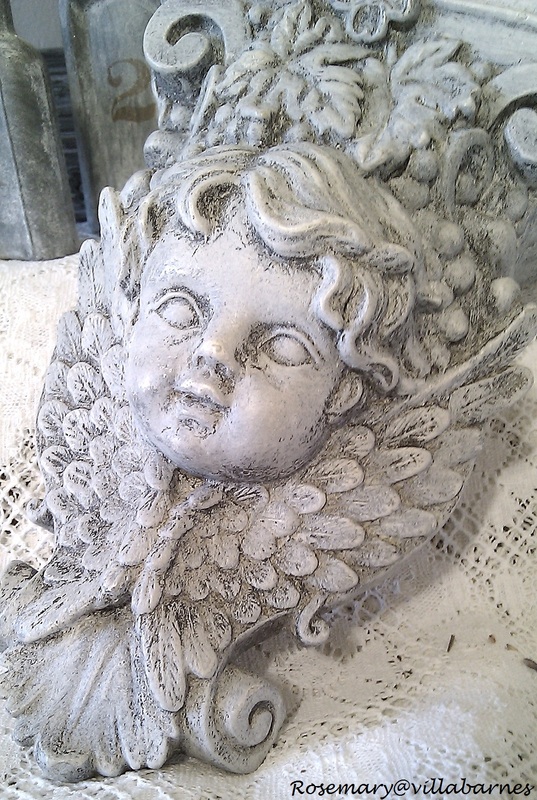 Absolutely love the cherub, Rosemary! 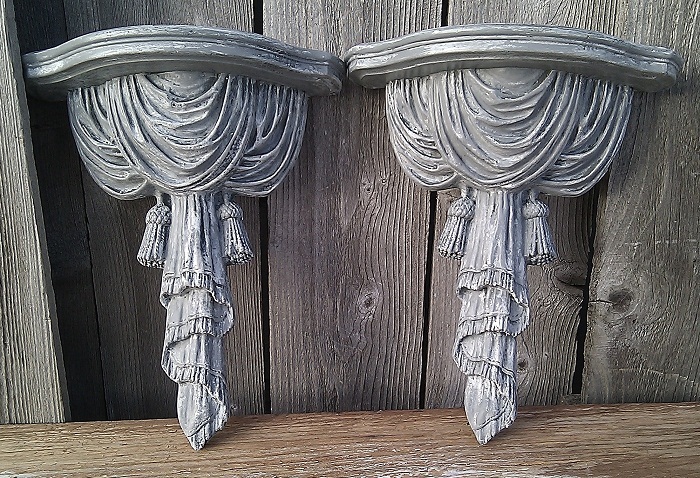 The corbels look like they have more depth in the gray tone and they turned out wonderfully! Wow I love how these turned out. What a cool treatment! Thanks for stopping over! Beautiful transformation Rosemary! I just bought some Gesso and I can't wait to try it. Wish me luck! I especially love the bottles Rosemary, they will be good sellers I bet! Love, love those corbels. 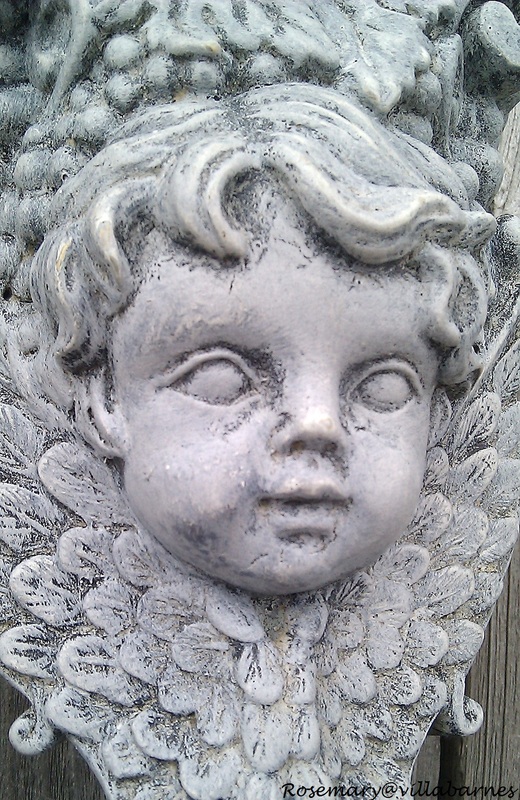 The cherub is sweet! 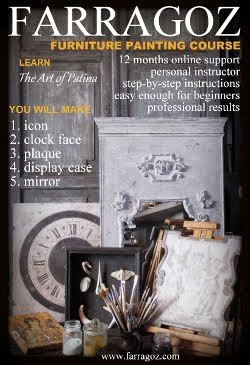 Love the jars, I might try that on some old jars I have :) Never used gesso, but i'm willing to try. I need some of that "old world" in my dining room. 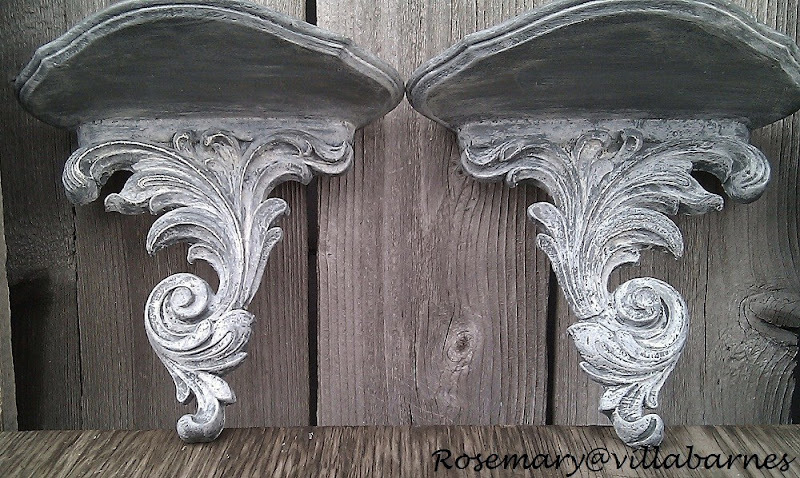 Rosemary, I really like how the corbels and jars turned out. I didn't know you could paint over the glass bottles like that. Cool! Only you would have those cute little rusty stars too. 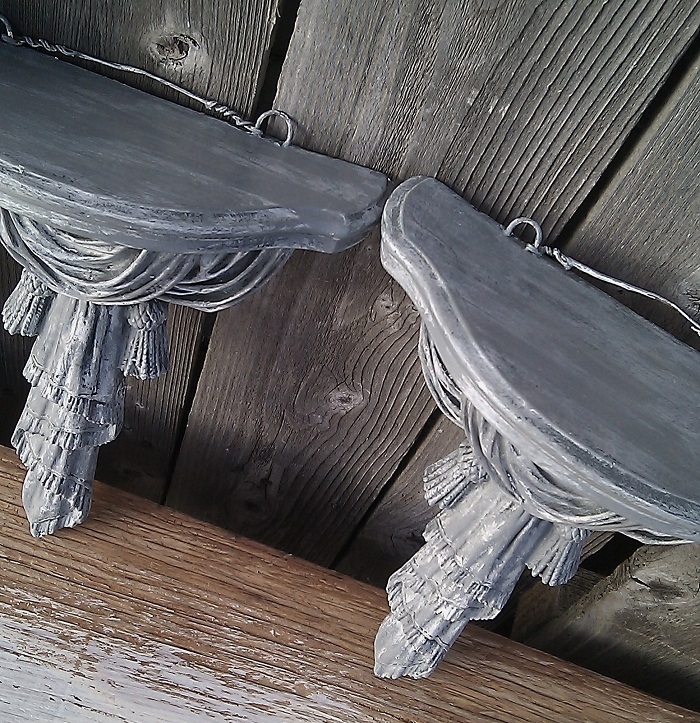 very lovely corbels..the color is perfect!! and the bottles-OMG!! 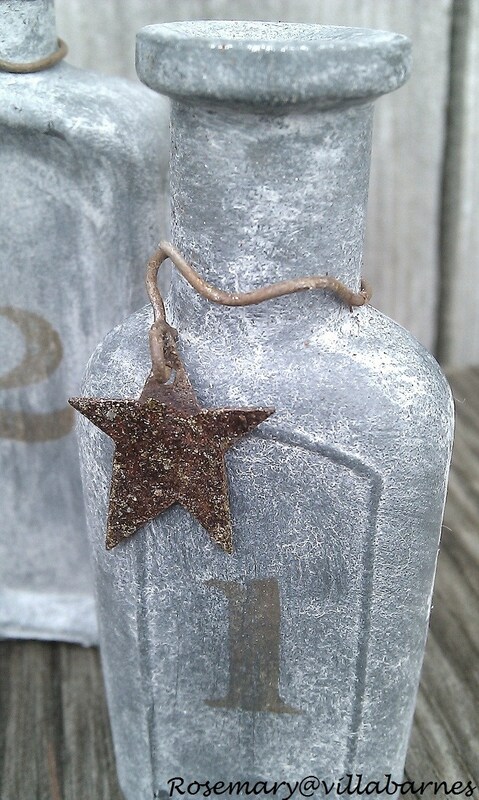 so cooooolll...love the rusty little star too! Love the bottles! Nice finish. These are all lovely. 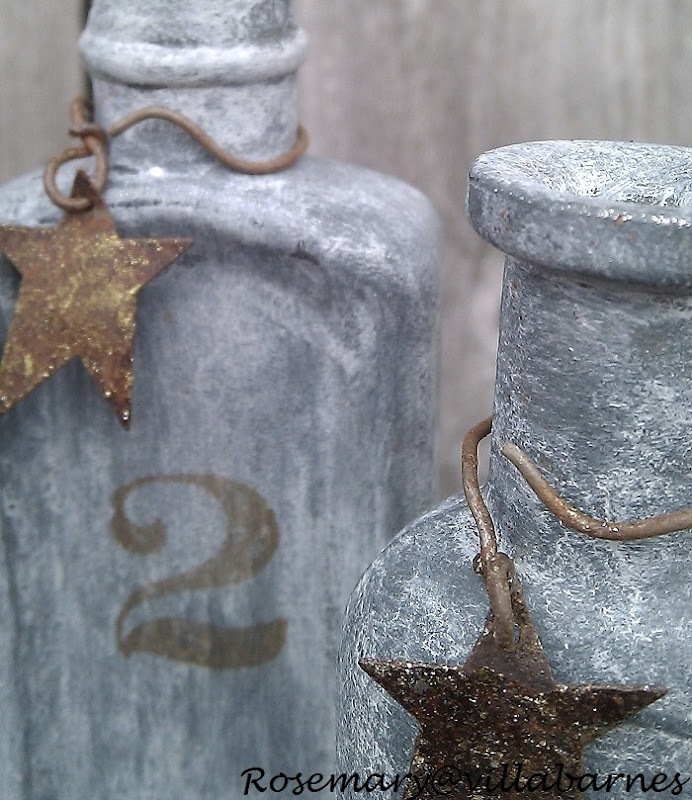 I really like the textured finish and the rusty stars on the bottles is just perfect. Thanks for sharing! 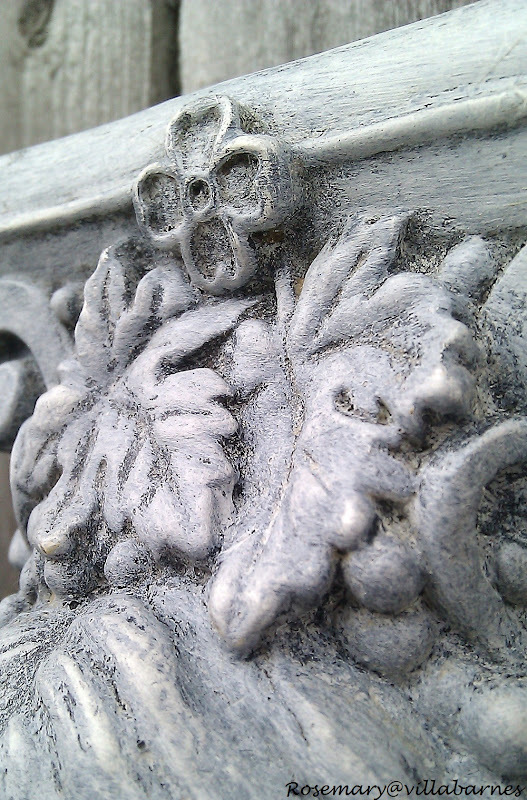 wow, every piece looks fabulous in the grey.. You are a master at this. These are stunning...everything! Love those bottles, too. 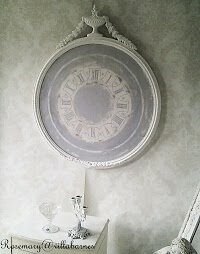 I have actually done gesso and then paint over it to get a similar effect. I love the old world look and you are a master! Wonderful Rosemary! Love it all! 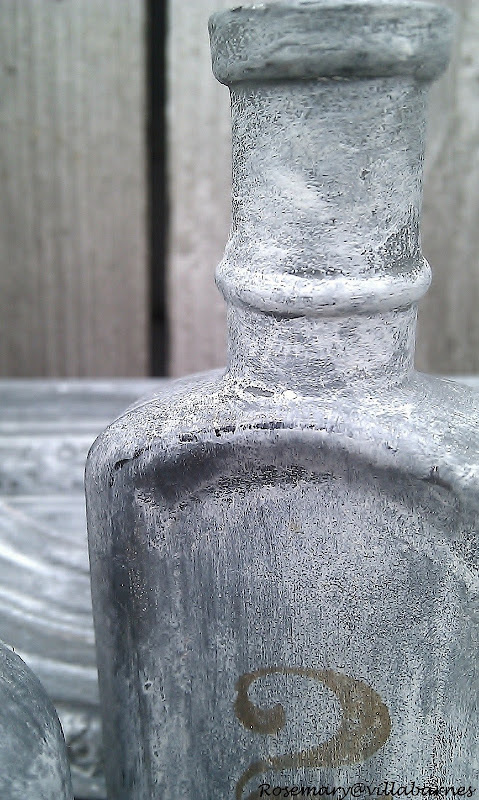 The corbels are great and the rusty stars on the bottles are so cool. wow! that looks so awesome. even the rusty stars look new. great job! Everything you do turns out great! 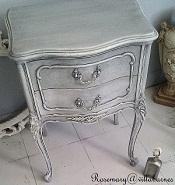 I absolutely love all these finishes in gray! Beautiful, as always! 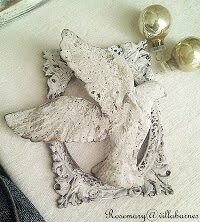 I am going to have to try gesso one of these days! 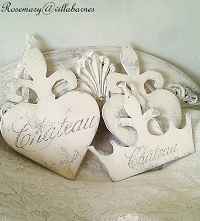 I adore the corbels and the altered bottles! They are charming! Thanks for sharing at Potpourri Friday! This is too cool. I love it. You're a gesso queen! I always used gesso to prime my canvases, but you are bringing in a whole new dimension of how to play with this.